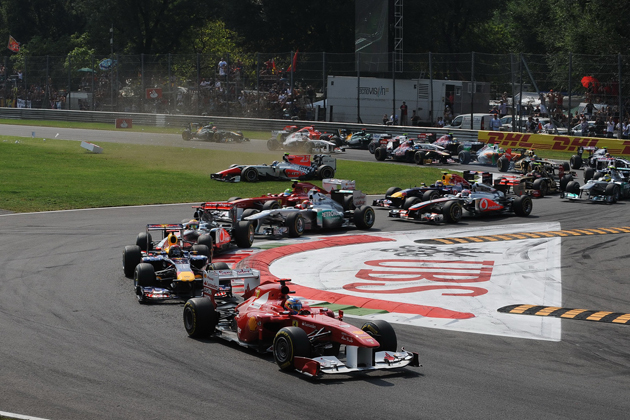 The Championship after an unsteady weekend at Monza in the 2011 Italian GP looks like it’s heading the same way we saw during the initial part of the 2011 F1 season. Red Bull’s dominance in Formula One continues. They’ve been consistently proving they’re faster than any car in the circuit including the McLarens and the Ferraris. Sebastian Vettel’s successful flight continues, claiming his eighth victory of this season’s F1 Championship in Italy, and it looks like he’s almost sealed off this season’s title too with still six races to go this season. Red Bull, as a matter of fact, is atop the constructors’ table with now the gap between McLaren and Red Bull being 126 points. One of the reasons Red Bull are on top is Mark Webber’s been scoring some impressive points too with superb finishes except for a few ups and downs taking their total tally of points in the constructors’ table to 451. Both Vettel and Webber have been contributing to Red Bull’s constructors’ tally and performing their best in most of the races so far this season. McLaren too have been getting some good results, but a bit inconsistent when it comes to scoring points on all the venues with some races going exceptionally well for them and in some not the desired results the drivers wished for. Both the McLaren drivers, Lewis Hamilton and Jenson Button have won 2 races each this season and were not able to effectively finish in many races. So, as a result, McLaren’s scored 325 points with Ferrari close behind them in 3rd at 254 in the overall constructors’ standings. Both Red Bull and McLaren drivers are scoring points for the team whereas team wise Ferrari’s having problems with inconsistent performances affecting their constructors’ points significantly. Spaniard, Alonso has been having a good season so far, but not able to still outpace Red Bull, but driving as hard as he can and very consistent in all the races, but Brazilian, Felipe Massa, on the other hand, hasn’t been consistent for Ferrari not making it to the podium even once this season. Alonso has won one race in this year’s 2011 F1 season. Mercedes GP are showing pace and were strong last weekend at Monza with Michael Schumacher at his best finishing fifth in a race that saw him battling with Lewis Hamilton for almost half the race while Nico Rosberg, his teammate, had to retire in the first corner of the race when Liuzzi erred and took some drivers along with him. Mercedes GP currently are in fourth position, and with a good last weekend at Monza, they now have increased their gap with Lotus Renault GP to 38 points. Lotus Renault’s currently running in 5th. A significant shift seen in the constructors’ table was with Force India Mercedes who now are sixth securing 4 points at Monza. The midfield battle, however, continues to heat up with Sauber currently demoted to 7th in the constructors’ table. Toro Rosso’s also seen fighting for the 6th spot with 29 points and Williams’ seen running at a poor 9th with a paltry 5 points. Team Lotus’ running in 10th, Virgin Racing Team in 11th and Hispania Racing Team in 12th place. These teams are yet to open their account this season. Looking at the constructors’ table with 6 races left, Red Bull look very strong and likely would win the constructors’ Championship this year too. Christian Horner would be a very pleased man with both Vettel and Webber proving tough customers to be challenged given their outrageous speed in all the races this season, though Vettel’s proved he’s the team’s first driver with his 8th impressive win at Monza. Mark Webber’s current season looks a bit disappointing compared to Vettel’s success. There’re still doubts casted as to whether Webber’s given the same priority by RBR than they do to Vettel. Webber might be old, but certainly one of the most experienced drivers in F1 today. It also looks like he’s almost conceded the Championship to Vettel this season. Team Principal, Horner had indicated they’re not partial by any means and considered both the drivers equally. While Webber looked good in some races and crashing out with mechanical issues in some, it’s debatable and totally not convincing whether he’s been outsmarted by Vettel’s superb driving skills or not given a proper car to race alongside others in the circuit; however, Red Bull’s in a very strong position for clinching the constructors’ Championship this season. McLaren, on the other hand, as discussed previously, looked very good in some races and consistently bad in others. Their inconsistency’s the key for the huge gap between RBR and them in the constructors’ table. Both Jenson and Lewis have 2 wins each this season and looked to challenge RBR at the start of the season, but that seems to be fading away right now with just 6 races remaining. With Sam Michael joining McLaren next season, they can be hopeful of winning the Championship in 2012 when Sam brings in his vast experience in racing to the McLaren Mercedes Team. Ferrari’s 2011 season can be seen as a very good one for Alonso, but not a very good one for Felipe Massa. With Red Bull already stamping their authority pace wise, Alonso was doing his best to keep Ferrari’s spirit alive. We’ve already seen RBR’s pace much better than that of Ferraris or the McLarens in 2011. At least, it was hoped Ferrari would be up in the constructors’ table somewhere better than they’re now, but Massa’s inconsistency has brought the team down. Massa’s not even claimed a single podium finish in 2011, which certainly is a worry when Ferrari looks forward to the 2012 season. Fernando Alonso, by far, is one among the best drivers in F1 today, but the car’s not doing enough for him; for given a good car, he surely can challenge Vettel any day. Mercedes GP’s another team that’s making tremendous progress, though much was expected from them considering Brawn’s brains in steering BrawnGP to its debut win in 2009, but Brawn admittedly has conceded they needed to be patient and consistent when it came to challenging top running teams in F1. While Brawn’s targeted 2013 to be the turning point when they hopefully aim to win a title, they’re not particularly doing bad this season with Michael Schumacher and Rosberg driving significantly well placing Mercedes GP in 5th currently. Another improvement seen is in Force India Mercedes with both Sutil and di Resta getting points aboard and sitting comfortably at 6th with Sauber and Toro Rosso not far behind. The situation with Williams is a bit disappointing with only 5 points managed so far. The remaining teams including Lotus have to work hard and haven’t yet scored any points for their teams.